Instagram is a huge platform so you definitely need to know how best to engage your target customers on it. 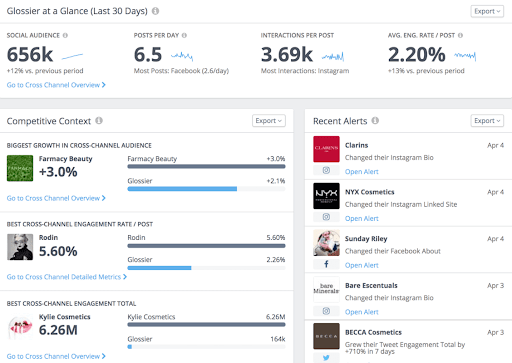 And Instagram analytics tools are your best bet when it comes to doing just that. But there’s a plethora of these tools out there, which becomes a huge problem for many social media marketers — as picking the best Instagram analytics software can be difficult. Keyhole helps you track relevant accounts and generates a visually rich report that shows you how to optimize your instagram marketing for better results. For instance, it can show you when your users are most active so you can improve your efforts for increased engagement. Neil Patel describes the tool this way: “This tool (Keyhole) does a lot of things others can’t. And as a bonus, it’s extremely user-friendly.” There are other great features it possesses as well. It helps you monitor sentiments around your brand and oversee your overall brand health. Plus, you can also track web mentions. Even more, it lets you track the influencers sharing Instagram posts with certain keywords or hashtags, the sentiments around those posts, the impressions and reach they generate, and even other keywords and hashtags users use alongside your searched terms. This way, you can spot out the best influencers for your brand and see their engagement rates, reach, etc. For example, here are the hashtags generated from Keyhole that consumers use when posting about #TBT on Instagram. Price: Starts at $179 USD per month — custom pricing. AgoraPulse isn’t just a social media management app, it also shows you Instagram metrics critical for results on the platform. This tool shows your Instagram marketing results instantly and lets you download it as a report to share with your clients, bosses or team. It also helps you measure engagement on your account, showing you changes in the percentage of specific metrics during a particular time period. Price: $39 — $239 USD. 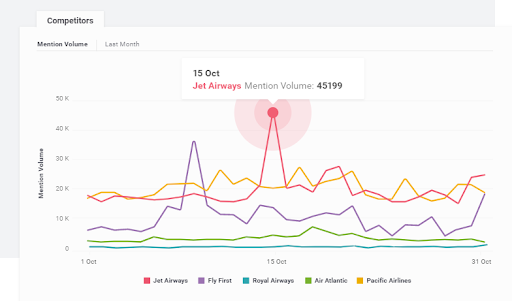 Brandwatch provides you with data on conversations about your brand, competitors and industry. This tool searches the entire Internet for reviews, comments and articles around your business. It also helps you see, particularly on Instagram, how you stack up against your competitors in terms of the volume of mentions you’re getting compared to theirs. With Brandwatch, you can receive email alerts about critical Instagram conversations so you can quickly spring into action when needed. Price: Contact Brandwatch to discuss a unique plan. 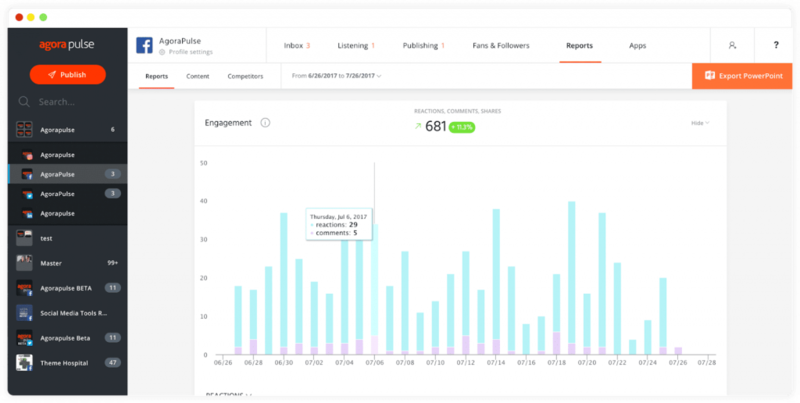 Besides helping you publish Instagram content directly, Hootsuite also let’s you see critical analytics about your market on Instagram. Like similar tools, it helps you keep track of your customers, competitor and brand performance on Instagram. You get to see visual reports of what’s working for your business on Instagram and what’s not. Price: $19 USD per month — custom pricing. This tool shows you your community growth on Instagram over specific time periods — how far you’ve grown from period A to period B.
Iconosquare shows you where your Instagram users come from and the languages they use. It also reveals the number of impressions and reach you get from your Instagram posts and stories. Pretty much like most of the other tools, it tells you what works and what doesn’t for your Instagram audience. Price: 29€/mo — custom pricing. Like most other social networks, Instagram has provided its own analytics feature. It tells you in one glance how your stories and pictures perform with your audience and that lets you know what works best on the platform. Instagram analytics shows you data in three sections: activity, content and audience — telling you the total number of engagements your account has over a specific time period, the posts that performed best and the audience data respectively. All you need to get access to these analytics is to convert your Instagram account to a business profile. 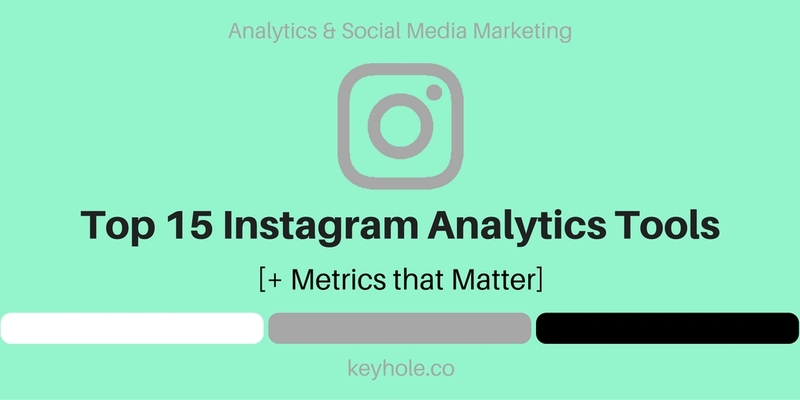 As shown in the image below, Minter.io provides you with Instagram metrics like most of the other tools mentioned in this list. The tool gives you a bird’s-eye view of how your hashtags and keywords are faring on Instagram, the best performing content types, the most engaging photo filters and even the best times to post. You also get to track how much Instagram traffic is sent to your website and the engagement levels your stories get. You can also export your data in a visually appealing format that allows you to easily keep other stakeholders informed about your Instagram marketing performance. Price: $99 to $399 USD per year. 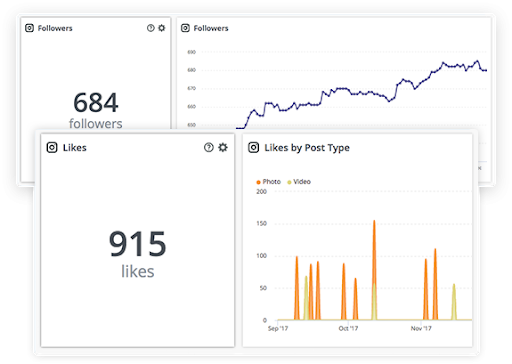 Quintly offers you an Instagram analytics feature that helps you measure the follower growth of your Instagram account and that of your competitors. This indicates how many unique consumers are finding your brand on the platform, compared to your competitors. The software also provides an Instagram content analysis feature, where you can see which content types perform best so you can always replicate success. Price: $100 to $480 USD per month. 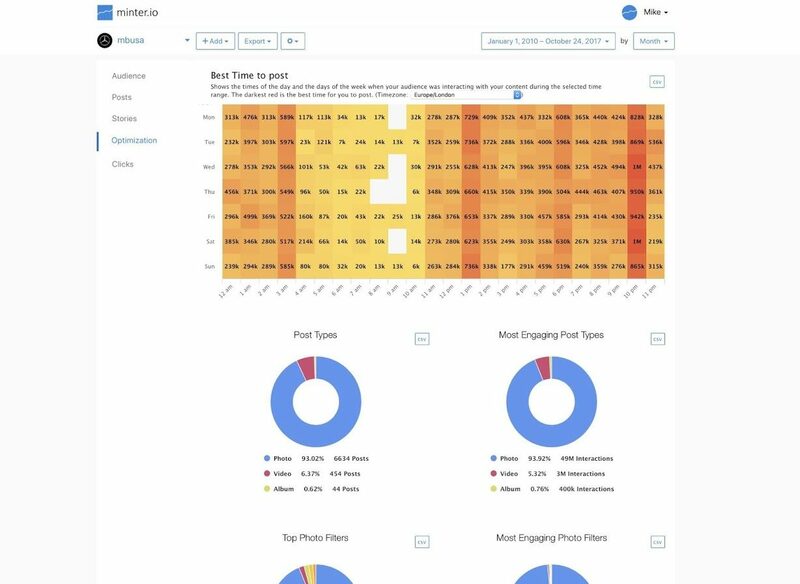 With Rival IQ, you can run your Instagram competitive analysis in minutes. You’ll see the speed at which your competitors are gaining followers, how often they post, what their engagement rates look like, and their most engaging Instagram content. The tool also alerts you when a main competitor starts spending ad money on a post. Brands mostly boost posts that are already gaining success organically so this feature tells you what content performs great for your fellow industry players. Price: $199 — $499 USD per month. Socialbakers helps you monitor and listen to conversations and topics your audience care about. This lets you know which content to create and how best to engage your audience and spike the right actions from them. Like many other Instagram analytics tools mentioned here, this tool also helps you identify positive or negative sentiments around the posts on your searched keywords, hashtags or accounts. You can categorize posts by sentiments as well so you always understand where to look and respond to first. Price: Starts at $20 per profile. Sprout Social provides an Instagram analytics tool that gives you quality insights about your market and audience. This tool lets you compare follower and engagement stats between brands on Instagram. You get unlimited reports and data about specific posts, hashtags, keywords, audience and competitors. With all this information, you can better create and execute Instagram marketing strategies that really move the needle for your business. Price: $99 — $249 USD per month. 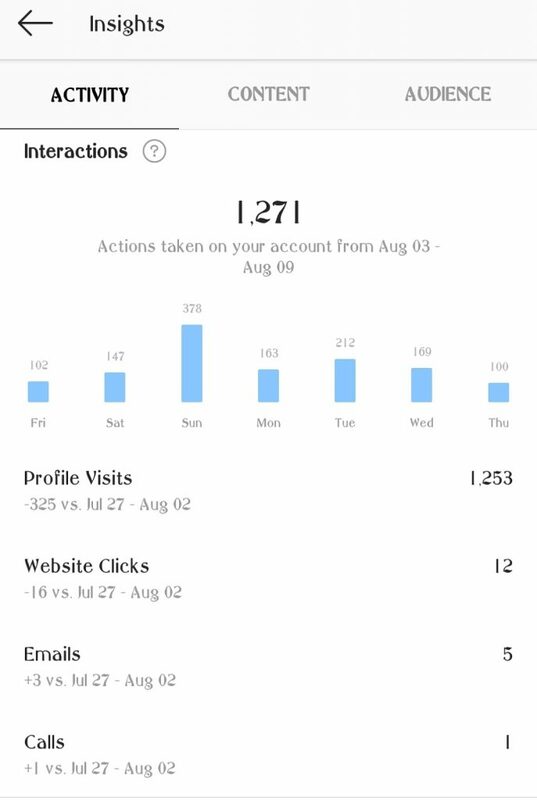 Squarelovin is another great Instagram analytics software. 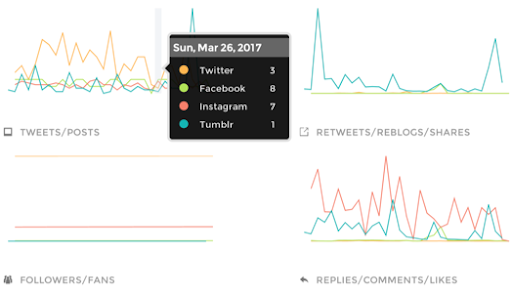 The tool lets you track and compare engagement rates, follower numbers and content performance. It also lets you see what times your users respond to images the most with likes and comments. This tool provides you with social listening and audience insights. Synthesio has a robust metadata about the content, author, and tone of mentions in its social listening platform – and can easily be filtered. This means it provides an intelligent platform that analyzes conversations and figures out the sentiments around them. Price: Contact Synthesio to discuss a unique plan. Much like all the Instagram analytics tools featured in this piece, Unmetric provides you with critical data about your Instagram market. It shows you which content performs best in your space, discovers branded content almost as soon as they hit Instagram and helps you benchmark all your data against that of your competitors so you can measure your efforts on Instagram. Price: Free — $1000 USD per month. Union Metrics provides you with real-time insights from major social networks including Instagram. This tool provides similar analytics like most other Instagram analytics tools — showing you impressions, reach, best performing content, new ideas for content and more. Price: $23 — $159 USD per month. Besides pricing and features, you want to ensure the Instagram analytics tool you’re buying or at least trying out measures the metrics you want to measure. Follower Growth: The increase in an account’s follower number after deducting unfollower numbers. Engagement Rate: The total amount of likes, comments and reshares that posts receive, divided by the total number of posts. This rate is restricted to given time periods. Optimal Post Time: The best time to post depending on which times the highest engagements happened in the past. Optimal Post Filters: The ideal filters to use, typically based on which ones generated the highest engagement rate. Optimal Hashtags: The best hashtags to use depending on which ones got the highest engagement rates before. Top Followers: An account’s most followed and engaging followers. Follower Age: The age ranges an account’s followers fall into. Follower Gender: The gender ratio an account’s followers make up. Follower Interests: The interests — ranging from sports to business — an account’s followers have.Follower Location: The geographic locations an account’s followers have listed in their profiles. Depending on the tool, tracked locations can range from country to city-level. Activity Volume: The number of posts, over a given time period, made with a tracked hashtag or keyword. Impressions: The number of times a post is displayed to users. A user can see a post more than once, meaning he or she can be responsible for many impressions. Reach: The number of unique people who received impressions of a post. Engagement: The number of likes and comments a post containing a tracked hashtag or keyword has earned. Top Users: The Instagrammers who generate the highest reach, impression and engagement numbers per post using a tracked hashtag or keyword. User Demographics: The gender, location, device use and other characteristics of users posting with a tracked hashtag or keyword. It’s important that you pick the tool that not only suits your wallet but also tracks the main metrics you need. Try the tools out before deciding to pay for any of them and make a well-informed decision on the one that’s best for your Instagram marketing strategy.